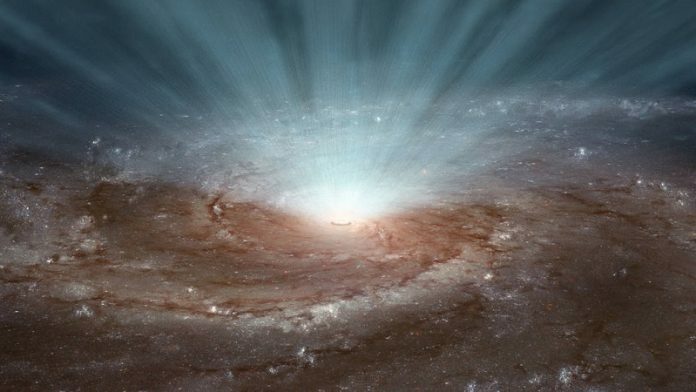 How black hole winds blow. Credit: NASA/JPL-Caltech. In a new study, researchers are asking the publish to help interpret data from the detection of gravitational waves. The gravitational waves were generated by the collision of binary black holes. The researchers hope to start a global volunteer computing effort, in which the public will be invited to lend their own computers to help scientists study the gravitational waves. The study was led by West Virginia University assistant professor Zachariah Etienne. Gravitational waves were first predicted by Albert Einstein in 1916. They were supposed to be are ripples or disturbances in space-time and might contain important information about changing gravitational fields. In 2015, scientists detected gravitational waves from colliding black holes for the first time. The finding has enabled scientists to observe cosmic events billions of years ago. It also helps test theories that help explain how the universe works. Since that discovery, scientists have detected gravitational waves from eight additional black hole collisions. Now they have started new observations with more sensitive detectors. The team hopes that the general public can help generate self-consistent simulations of these extremely energetic collisions. They need computing capacity to run the simulations to cover all possibilities about the features and information in gravitational waves. The researchers suggest that each desktop computer can perform a single simulation of colliding black holes. This can help dramatically increase the throughput of the theoretical gravitational wave predictions. The simulations are important to extract information from observations of the collisions. They can fill large gaps in human’s knowledge about gravitational waves from these collisions. Current black hole simulations are far too small to properly cover this wide space of possibilities. The team is building a website with downloadable software. The website is based on the same Berkeley Open Infrastructure for Network Computing, or BOINC, a system used for the SETI@Home project and other scientific applications. The West Virginia team has named their project BlackHoles@Home and expects to have it up and running later this year.